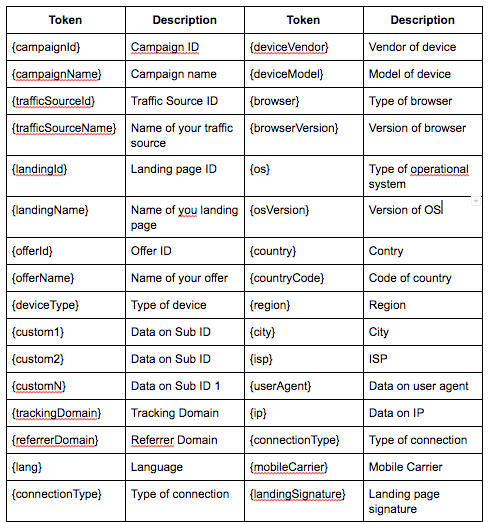 When setting up a landing page with BeMob, you see the list of available tokens below the URL field. Today’s blog post is dedicated to these tokens and their purpose. BeMob tokens allow the data to be dynamically added and refreshed on your landing page. Corresponding data will be uniquely assigned to each user, for instance: Dear iPhone 6 user! or Special offer for Greece! This is a very helpful trick to catch visitors’ attention. Follow these steps below to perform the setup correctly. 1. Log in to your BeMob account and find Landings tab on a panel. If you don’t have a landing page added in BeMob beforehand, press New. To introduce changes in settings for a page that already added in tracker, select it and press Edit. 2. Add required tokens from the list of available along with GET parameter to inject the data within your landing page. Token values are transmitted on a landing page through GET parameters. In our example we want browser data to be displayed on a landing. We use GET parameter p1 to add required data dynamically. Here is a list of available BeMob tokens with description. 1. Below you can see a part of script that allows to insert token values into your landing page dynamically. 2. After all the landing page settings are finished it is required to connect this page to a campaign, which can be done either through buit-in flow or flow settings. As a result, when going through the campaign URL the data on browser will be displayed on your landing page. Many traffic sources can pass the additional data to the tracker via custom parameters. To see the data from traffic source on your landing page add corresponding tokens to the URL. When testing a landing page you probably will try to copy the page URL and place it straight in browser bar. With BeMob your landing page can’t be accessed directly, only through the campaign URL. Hope that this user guide will speed up the process of adding a landing page. But where is the script or the code that we have to paste in the landing page for having the dynamic parameters ?